This VICI-research project is funded by the Netherlands Organization for Scientific Research NWO. In ‘standard’ minimal access surgery, the surgeon inserts rigid instruments through small incisions in the skin or natural orifices to reach targeted areas inside the human body. This approach drastically reduces the invasiveness of surgery compared to conventional open approaches, yet the reduced size of the surgical entry-point does also severely restrict the maneuverability of the used instrumentation. This lack of instrument maneuverability becomes especially apparent when considering Endoscopic Skull Base Surgery (ESBS). A prime target of ESBS are tumors on the pituitary gland positioned at the skull base, the region that separates the brain from the rest of the head. 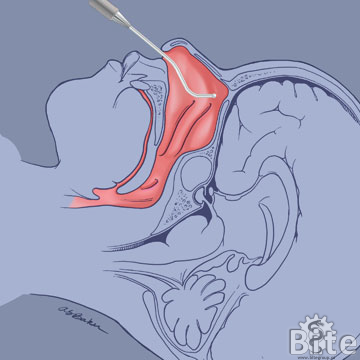 The nose is used as the surgical entry-point, and due to the rigid nature of the used instrumentation, the surgeon needs to create a straight surgical pathway to the pituitary gland. The limited width of this pathway in combination with the need for multiple instruments severely limits sideway movements of the instruments. This situation leads to a phenomenon called swordfighting wherein the shafts of instruments collide and, moreover, it severely restricts the maneuverability of the individual tools (i.e. grasper, scissors, etc.). We strive to improve on overall instrument maneuverability with the development of dendritic instruments. A dendritic instrument is a maneuverable single-shaft instrument that branches into multiple independently steerable tools. Such an instrument would eliminate the occurrence of swordfighting, as the number or shafts is reduced to one, while providing the surgeon sufficient maneuverability of the individual tools. This research project is divided into two main topics; the mechanical construction and methods of control of dendritic instruments, such that these instruments are able to be implemented in operating theatre in the near future. The mechanical construction of a dendritic instrument consists of two basic parts. First, there is the shape memory shaft that should be capable of following a curved trajectory up to the targeted area while providing a stable base. Secondly, there are the individual steerable branches that sprout from this stable base and provide independent maneuverability of each individual tool. Creating a steerable branch starts with a flexible structure, either containing joints or a compliant backbone. The actuation of such this flexible structure can then be realized by several actuation methods, including the use of electric motors, hydraulic actuators, and shape memory alloys. Our research is focused on a fully mechanical actuation method based on cable-structures. This allows for structures that are easy to miniaturize, eliminates the need for possibly dangerous electric currents, high pressures or high temperatures, and shows high potential for reducing the costs of fabrication. Besides the obvious requirement that the branches need to be maneuverable, they should also have a certain stiffness in order to cope with external forces that will be present during, for example, tissue manipulation. In our search for a suitable cable-structure to achieve high maneuverability and stiffness, we have developed a cable-structure in which multiple cables are placed at different angles along the longitudinal axis. This structure has already shown great promise and is now in the process of further optimization. Dendritic instruments consist of many small joints and branches which the surgeon(s) needs to actively steer, in order to perform complex surgical tasks (e.g. suturing or tissue manipulation). The amount of joints in dendritic instruments are even so many, that currently existing prototypes require the cooperation of two surgeons to perform a task which is actually meant for only one surgeon. In other words, dendritic instruments have more Degrees of Freedom (DOF) than any surgeon can control alone. However, the large amount of DOFs combined with an intuitive method of control is exactly what is required for dendritic instrumentation to become a reality. The BITE research method to dendritic instrument control is one which is exploration driven. The optimal mechanical construction and DOF configuration are still being researched. Hence, the accompanying control interface or instrument handle cannot be designed yet. To investigate the best methods of control, virtual instruments are simulated in a Virtual Environment (VE). Physical hand movements and gestures are measured with RGB-D Kinect cameras, and mapped to virtual instrument movements. By playing with the coupling between hand DOF and instrument DOF, new control strategies are tested and reverse engineered to ultimately discover the best method for dendritic instrument control.